Nuwakot, Nepal—Members of Jhpiego’s team in Nepal helped deliver emergency medical supplies to this Nepali village, which suffered heavy damage in last week’s earthquake. Nearly 800 people from this village died in the quake and 20 health facilities and four birthing centers were destroyed. 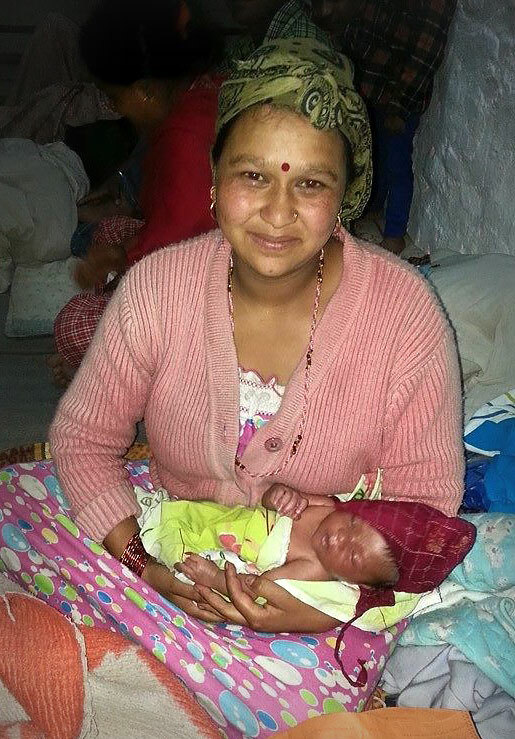 Dr. Kusum Thapa’s first person account of helping mothers and newborns take shelter following the earthquake. Dr. Kusum Thapa, Jhpiego’s technical leader, Upendra Dhakal and I traveled to the village, located about 50 miles outside of Kathmandu, the epicenter of the 7.9 quake, to assist the GFA Consulting Group, funded by Deutsche Gesellschaft Sur Internationale Zusammenarbeit (GIZ), in assessing the earthquake’s impact on health services for women and their families. Jhpiego provides technical support to GFA’s maternal and newborn care project that is working in 10 districts in the far west and mid-west of Nepal and Dhading District. All 61 Village Development Committees in Nuwakot District have been affected. Many of the mud-brick houses in this village collapsed during the earthquake, leaving piles of red rubble where homes once stood. Families are living in makeshift shacks of tin, pieces of wood and plastic sheets. The District Hospital had significant cracks, and several areas were too damaged to serve patients, said District Health Officer Biswho Ram Shrestha. Health services were relocated to less damaged areas of the hospital where patients could be treated. One female community health worker and an auxiliary nurse-midwife died in the earthquake and 12 health workers were injured, he said. Complete data are yet to come. Dr. Thapa visited the maternity ward and talked with the nurses, skilled birth attendants (SBAs) whom she had trained. They were preparing women in labor for delivery and she asked them if they needed any support. The SBAs were excited to see Dr. Thapa and most appreciative of her visit during this difficult situation. 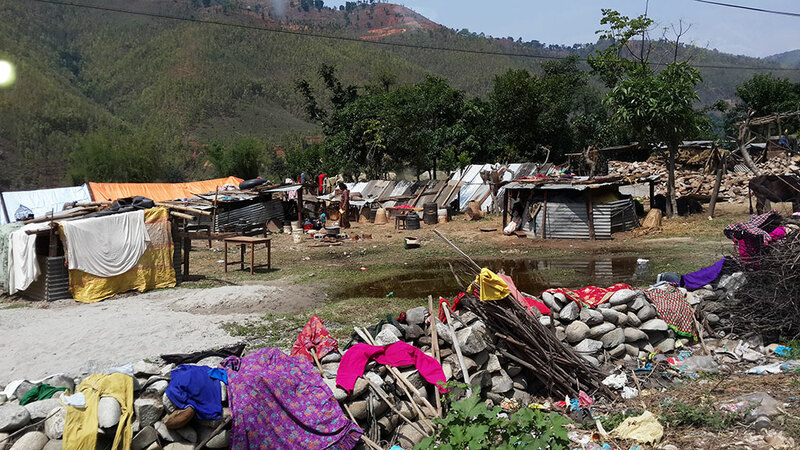 Nepal Villages in the aftermath. A Bhutanese Disaster Medical Team was on site, managing medical treatment and health services including surgeries. Medicine and medical and blood supplies were adequate and ambulances were running. But Mr. Shrestha said the health office’s challenge is determining the health needs of remote villages that were hit hard by the earthquake. “We are not able to reach many remote villages so we don’t know how many are injured and have died,” he said. He expressed concern about post-disaster disease outbreaks that may arise because of polluted drinking water and unsanitary conditions resulting from earthquake damage. He said the District Health Office plans to distribute 5,000 leaflets with educational messages encouraging handwashing, using proper sanitation and boiling drinking water. Mr. Shrestha asked for assistance in repairing cracked areas of the hospital—health workers are afraid to work in these areas, he said—and rebuilding damaged health facilities, birthing centers and the District Health Office. Chandra Rai is the Country Director of Jhpiego’s Nepal Office.